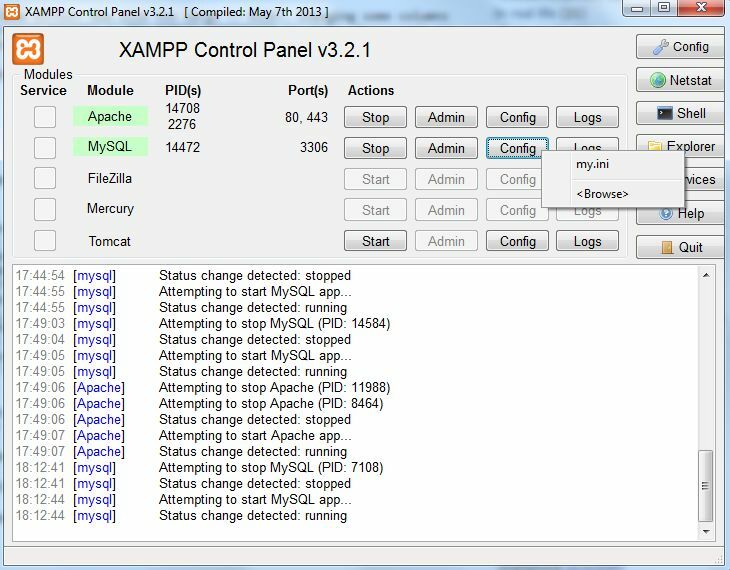 Ran into some problems recently with XAMPP. Exported a large mySQL production database and tried to import it locally in XAMPP (through Shell access). Error: ERROR 1118 <42000> at line 437919: Row size too large <> 8126>. Changing some columns to TEXT or BLOB or using ROW_FORMAT=DYNAMIC or ROW_FORMAT=COMPRESSED may help. In current row format, BLOB prefix of 768 bytes is stored inline. Doing so made it possible to import a 1GB sql table without any problem. This is just a webdevelopment template for PHP (all errors, xdebug), HTML, jQuery, Bootstrap (UTF8 encoding). A wordpress network / multisite setup uses virtual directories. Suppose you want to password protect only one subsite e.g. ‘janedoe’, you can’t just create a ‘janedoe’ folder on your webserver with a particular .htaccess in it. Mod_Rewrite enables you to do fancy stuff with URLs, but it isn’t always transparent when it comes to debugging. In a development environment it can be useful to enable apache error logging to see where a mod_rewrite line fails. In XAMPP you can do this by opening httpd.conf (open control panel > config > Apache (httpd.conf)) and append mod_rewrite.c:trace3 to LogLevel. It goes back to Internet Explorer 3.0, but EMs are still the better way to define font-sizes. It takes a small learning curve to get the hang of it, but when it comes to quick changes in overall font-size, this is the way to go. Default font-size for most common browsers is 16 pixels. There are only three articles you need to read to tame that size with relative ems. Still targeting Internet Explorer 6? While Internet Explorer handles EM, it does so only when the base font is set to a percentage! Posting HTML forms with special characters, while keeping your database clean. The best practice when storing data in a database is to store it in its most purest form. When allowing users to edit data through HTML webpages you need to encode some characters so your HTML-forms won’t break. You can do this by using htmlspecialchars (or htmlentities). Below is an example with htmlspecialchars where only the double quotes are escaped (ENT_COMPAT flag). Author JanPosted on 30th September 2009 Categories ICT, PHP, WebdevelopmentTags code examples, forms, html, htmlspecialchars, utf8Leave a comment on Posting HTML forms with special characters, while keeping your database clean.